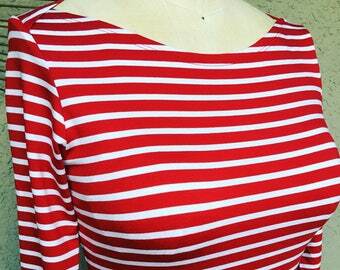 Authentic ready to wear from the 30s-50s! Announcement Hot tip! Enter your size into the search box in my shop to find garments in your size (XS, S, M, L, XL, 2X, etc.)! I have a random amount of sizes in tons of fun fabrics. Fab ready to wear vintage 1930s, 40s and 50s style looks, inspired by vintage garments and produced in the garment capitol of the USA. Thank you for helping me celebrate 9 years of great fashion on etsy. Last one into their cute outfit is a nudeedudee! I try very hard to source every bit of these garments from the USA, even down to the deadstock vintage fabric and labels! It is more expensive, but totally worth it. Sewn with love, fairly, in Los Angeles California. I love making authentic looking reproduction. Insist on quality. I've been making and wearing vintage reproductions since the early 90s (sheesh I'm old). I make things that I would like to wear, authentic looking pieces inspired by the past. When I found that I was too tall to fit into most of the real vintage years ago, I hit the machine to whip up a special outfit to keep up with my stylish friends. I've since amassed a world famous pattern and fabric collection and launched a wonderful etsy business. The rest is history! I'm selling ready to wear only for the time being. My eternal gratitude for my amazing customers who have bought custom from me for the past almost five years. It's been a wonderful trip but I need to switch gears to ready to wear in order to care for this little darling baby. Please contact me about wholesale, I love producing quality reproductions for my boutique owning friends. Please check my shop policies for return information. I donate a portion of the proceeds from this shop to humanitarian and environmental issues. We're all in this together. This is a labor of love, a childhood dream come true. Thanks etsy and to my darling customers, you make this all possible. Check me out on Twitter and FB as Nudeedudee Mercantile. Hot tip! 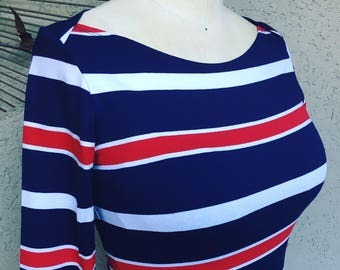 Enter your size into the search box in my shop to find garments in your size (XS, S, M, L, XL, 2X, etc.)! I have a random amount of sizes in tons of fun fabrics. Absolutely adorable!! May have to order in other colors too! Very fast shipping. Great seller!! 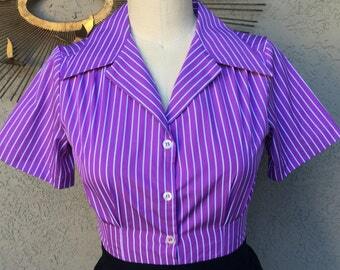 Adorable vintage-inspired blouse with attention to detail. Great communication and great product. Welcome fellow vintage style enthusiasts. I hope you love the things I've created, they are inspired by the best design ever created for women, the eras of the 30's to the 50's! Not responsible for loss or damage of the item once it has been shipped. I accept Google checkout, Paypal. CA residents will be charged the normal sales tax in CA. I ship First Class or Priority Mail. International packages will be marked as merchandise; there will be a customs fee involved, please check with your customs office for more information on receiving merchandise from out of the country. In order to guarantee great results, you should measure your body with a measuring tape and compare those measurements to the description of the garment. I tkae a lot of time to accurately portray the garment's measurements to fit your expectations. Accuracy in measuring yourself is key to your enjoyment of these special garments. You should only choose garments that reflect measurements larger than your body, otherwise they will pull and not close properly. I am not able to refund shipping on clothes purchased smaller than one's body. You will look most flattering in clothes that fit properly. It is in your best interests to measure yourself carefully. Although it is a popular request, it is not advisable to purchase any garment EXACTLY to your body measurements. 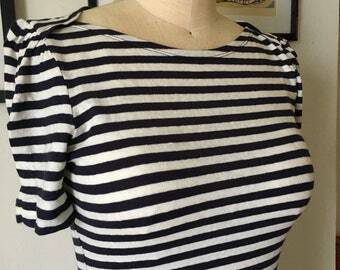 These garments need a bit of "ease" especially in the bust, so that you can move comfortably and raise your arms. These fabrics for the most part don't stretch, and I want these garments to be perfect for you! I do my best to create a fitted look while making the garment practical, comfortable, and durable. They will shrink slightly upon washing, although dry cleaning will reduce the shrinkage. Unfortunately these garments are not meant to be support garments, and will not "hold you in". Ladies back in the day wore support foundations like waist cinchers, girdles, and merrywidows under their clothes with every outfit that was close-fitting. I recommend using these garments if you'd like a tailored silhouette (I know I always do). Hope this information is helpful!